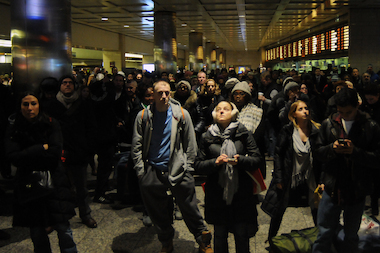 There were delays and cancellations on the LIRR during the Tuesday evening commute. MIDTOWN — Service on the Long Island Rail Road resumed with a close to normal schedule after a stalled train caused delays and canceled trains during the Tuesday evening commute, according to the MTA. The service disruptions affected trains heading out of Penn Station and Atlantic Terminal in Brooklyn ahead of rush hour. All westbound service from Woodhaven into Penn Station was suspended because of the disabled train in one of the East River tunnels. Trains heading into the city started running again by 7:37 p.m., the MTA said. Some riders were understandably frustrated. There were also “extensive” delays on Amtrak trains between New York and New Haven in both directions, according to officials. Heavy winds caused debris to fly into overhead power lines causing the delays, Notify NYC announced a little after 5 p.m.
Riders were advised to take alternate routes. The Metro-North New Haven line was running with good service Tuesday evening, according to the MTA. Check the agency's website for updates.